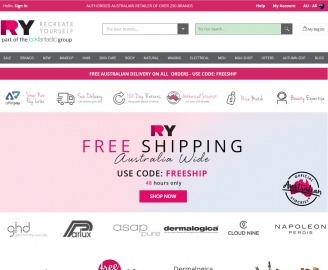 RY is Australia’s biggest online beauty retailer with premium beauty brands across skincare, haircare and makeup. Based on the Gold Coast, They are proud to be an authorized retailer for all brands sold on RY. 6% cash back on New Bodycare. 5% cash back on Existing Bodycare. 1% cash back on Technology. Click a Coupon or click Start Shopping to earn Up to 6% Cash Back at RY.com.au.